The College Bum, Sean Teeter, is back tonight with another FFVII review - take it away, Sean! Hi boys and girls, I know it’s been a long time, but I’m back. Between my new job and the complete lack of new figures in my neck of the woods, I haven’t really had any new additions to my collection –therefore, I haven’t really had anything to write home about. Well, the dry spell still hasn’t broken, but there’s been a trickle here and there. Tonight I’m reviewing a figure that I’ve had my eye on for a while. Square Enix’s Final Fantasy figures have quickly become my favorite non-sixth scale line. 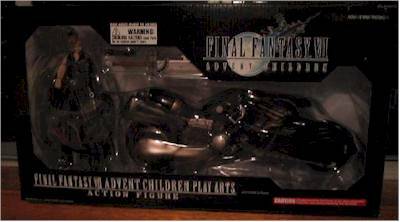 I was impressed by their X-2 figures, and their Advent Children figures were even better. The moment I saw a preview of the Cloud Boxed Set, I knew Sephiroth would have to scoot over a bit on my shelf to make some room. 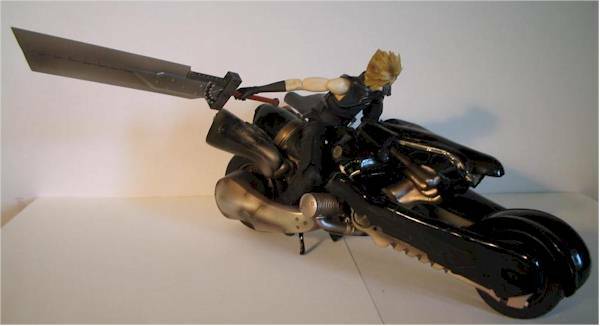 However the $60 price tag, plus shipping, has kept me from snagging Cloud and his bike until now. The Cloud figure is being sold by himself for as low as $15 at some stores. Is this set worth the extra $45? When I received my package, I thought the shipping box was a tad big . . . until I removed the actual product itself. This is one big box –it’s almost a foot and a half long! 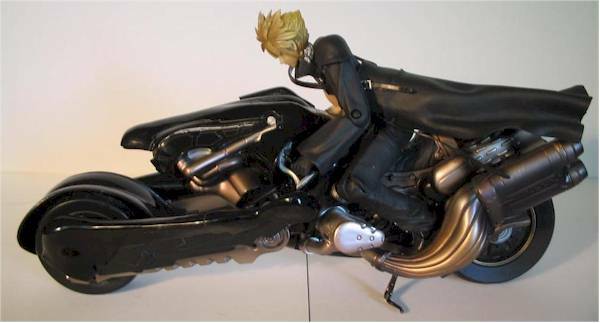 Cloud and his bike Fenrir are held in a plastic tray behind the front window. The box is pretty collector friendly –no wires, just the tray and a little tape to seal the flaps. The back has some nice photo art and display instructions. I gave the other Advent Children figures four stars across the board, but here I feel Cloud doesn’t quite measure up to the others. The outfit design is pretty dead on compared to the film design with his baggy pants and turtleneck sweater vest. His half skirt is adjustable which helps when he’s sitting on Fenir, however it is missing the sword holster seen on his back in the movie. 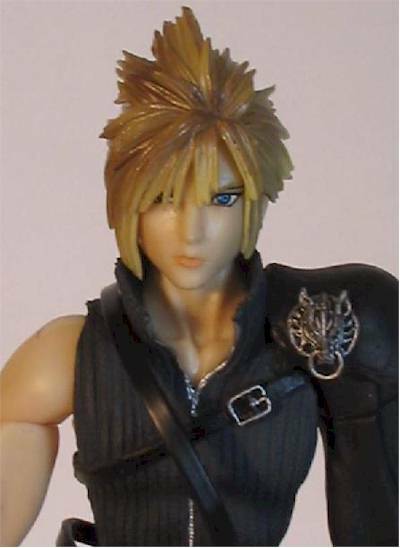 The head sculpt seems a little off; in fact Cloud looks a tad feminine. The hair is a bit of a mess, but it is kind of a hard transition from the animated spiky ‘do to a sculpted version. There’s no bleeding on this figure but there are still some issues to be found. The skin tone on the arms doesn’t match the tone on the main body. The eyes while perfectly painted are a bit flat. 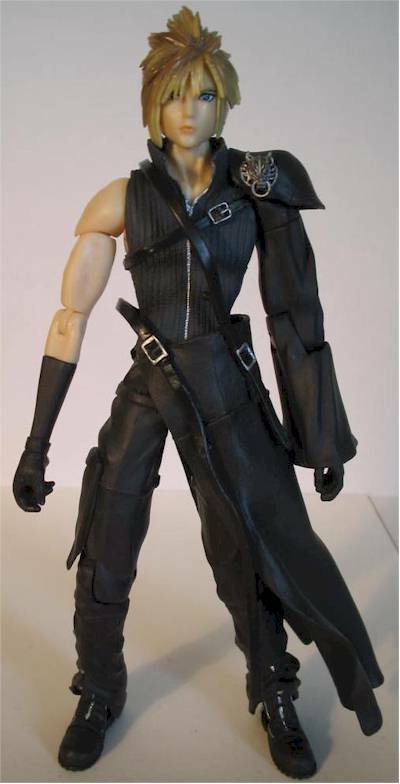 Like the other figures in this series Cloud is mainly clothed in black. From the shots of the next Final Fantasy series, it looks like we’ll finally get back to some colorful figures in the future. Cloud has eighteen points of articulation: ball-joints at the head, shoulders, hips, pegged knees, elbows, ankles, feet, and cuts at the waist, biceps, and wrists. Cloud’s arms feel a bit week, especially the right one. 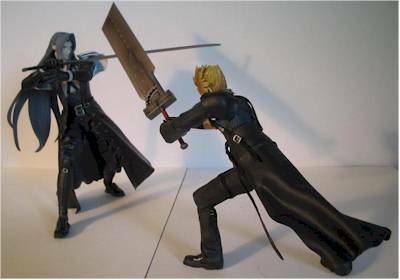 It’s very hard to affect one armed poses with Cloud’s sword. The legs pop off and one really easily as well, and I get the feeling they might weaken like the arms after a while. Strength issues aside Cloud can hold some nice poses, and most importantly he can ride his bike. Well the boxed set is being sold on the strength of an accessory, so it’d better be a damn good one. And the answer to that is: it is. 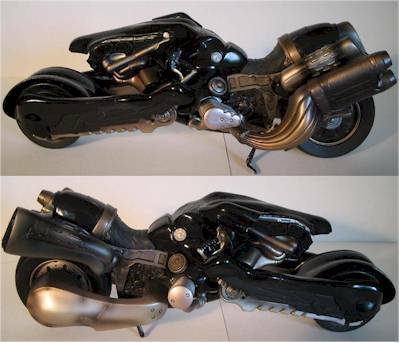 Fenrir is a beast, and is simply one of the coolest friggin’ motorcycles ever sculpted. The look of this piece is an excellent mix of organic design and hardware. The bike almost looks like it could be alive. Every little nook, cranny, line, and part is sculpted to a tee. 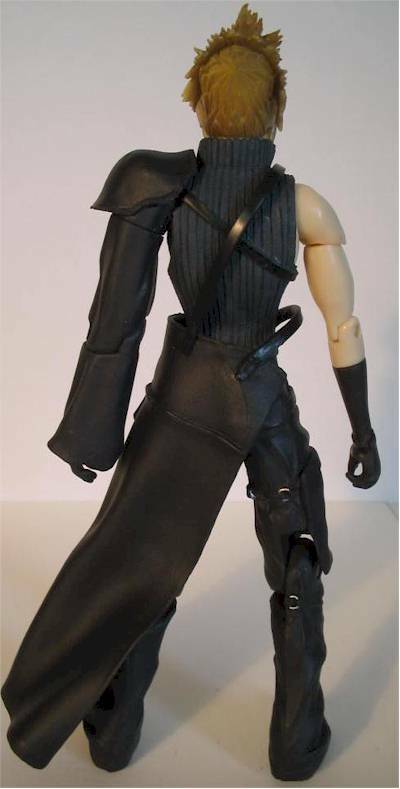 It mimics the design from the Advent Children movie perfectly –which is also a problem. While this bike looks awesome, it feels weak in some places structurally. 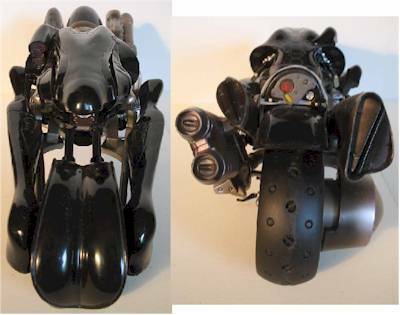 The rear wheel is only supported on one side by a piece of plastic. The plastic flexes with the weight of the bike. While this gives the illusion of a rear suspension system, I worry that this will end up weakening the piece and snapping it off. The front suspension also feels weak. The two spokes leading to the wheel just feel like they might pop off some day. They’re made to flex loosely from limited ball joint connections at the top and bottom, but feel like too much flex can’t be handled. However, Fenrir is obviously not made for small children to slam around on the floor or into other vehicles. The bike is made to look good and display well –and it aces those requirements. Unlike the movie, Fenrir does not have a loaded weapon’s rack in the front, but we can’t have everything. In addition to Fenrir, the set also comes with the same accessories found in the standard Cloud figure release: his Buster sword, an extra hand, and his stand. 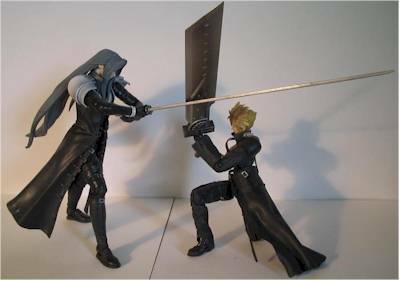 The stand is the same one found with the other Advent Children figures and works well. His two right hands are practically the same, except one’s a loose grip and the other’s a tighter one. I’ve always had mixed feelings about the size of Cloud’s sword. Sometimes it looks cool, sometimes it looks downright ridiculous. In the end we’re just left wondering whether or no Cloud is over-compensating for something . . . But I digress. The sculpt is excellent and dead on compared to the movie version. It is a bit thin however, and made from fairly rigid plastic. While it won’t wilt, you don’t want to catch it on anything or accidentally bend it. Cloud is definitely of the highest quality when it comes to design and materials, but he has some flaws in his build. The soft-goods outfit and arm joints could cause some problems down the road. I’ve had problems with the pricing of the Final Fantasy figures in the past, but usually I could snag them for around $12 to $14 if I looked long enough. The cheapest you’re going to snag this boxed at will be around $60. With the regular release of Cloud at $15, the extra $45 goes towards packaging and Fenrir. Frankly I feel that this set could have been around $15 cheaper. CornerStoreComics and Amazing Toyz has the set for $59.99. Despite the price, I feel this is pretty good set. The motorcycle is a top-notch vehicle and Square Enix still shows they know their stuff in this line. The weaker joints are a bit of a let-down, but Cloud still looks great on the shelf among the other Final Fantasy figures. There seems to be a bit of a vacuum in the toy industry these days, so it’s great to still see something other than K-Mart and Target friendly figures out there. 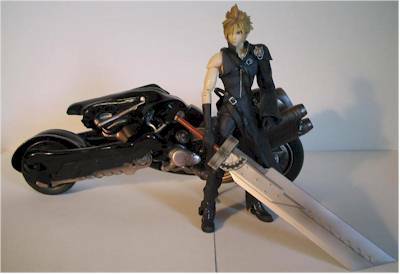 I think it was shrewd of Square Enix to produce two versions of this figure, since Cloud is the hero of this series. Depending on the size of your pocketbook, you can go for the standard version or the boxed set. Or both. All I can say is that in the end, I’m still a fan of these figures, even if the prices are a bit high sometimes and I can’t wait for the next wave to hit the virtual shelves.